Perez-Batlle, M.; Pastor, E.; Prats, X.; Royo, P.; Cuadrado, R.
Best paper in track award. ATM Seminar Eurocontrol/FAA (2013-06-13) When an airliner and a Remotely Piloted Air System (RPAS) have conflicting courses that may compromise the minimum safety separation between them, how much in advance should the RPAS start the separation manoeuvre? Which is the optimal heading change that will guarantee the desired separation distance with a minimum reaction time? These same questions can be asked if it is the airliner that performs the separation manoeuvre. In this paper the time reaction margins for both aircraft are analysed assuming they are equipped with Automatic Dependent Surveillance (ADS) systems able to exchange aircraft intents. Due to their small cruise speeds, RPAS manoeuvres must be initiated well before the airliner ones. This leads to some safety buffer in case the RPAS cannot comply with the required change of trajectory or if it becomes suddenly unresponsive (due to an internal failure or because a lost-link situation). The paper also assesses the operational point of view by simplifying the reaction times and conflict geometries by grouping them in a small set of cases, regarding the severity of a loss of separation event. When an airliner and a Remotely Piloted Air System (RPAS) have conflicting courses that may compromise the minimum safety separation between them, how much in advance should the RPAS start the separation manoeuvre? Which is the optimal heading change that will guarantee the desired separation distance with a minimum reaction time? These same questions can be asked if it is the airliner that performs the separation manoeuvre. In this paper the time reaction margins for both aircraft are analysed assuming they are equipped with Automatic Dependent Surveillance (ADS) systems able to exchange aircraft intents. Due to their small cruise speeds, RPAS manoeuvres must be initiated well before the airliner ones. This leads to some safety buffer in case the RPAS cannot comply with the required change of trajectory or if it becomes suddenly unresponsive (due to an internal failure or because a lost-link situation). The paper also assesses the operational point of view by simplifying the reaction times and conflict geometries by grouping them in a small set of cases, regarding the severity of a loss of separation event. Perez-Batlle, M. [et al.]. 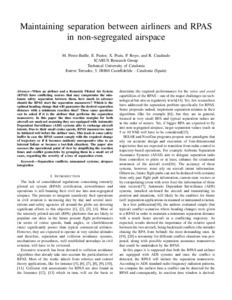 Maintaining separation between airliners and RPAS in non-segregated airspace. A: Air Traffic Management Research and Development Seminar. "Proceedings of USA/Europe Air Traffic Management Research and Development Seminar". Chicago, IL: 2013, p. 1-10.